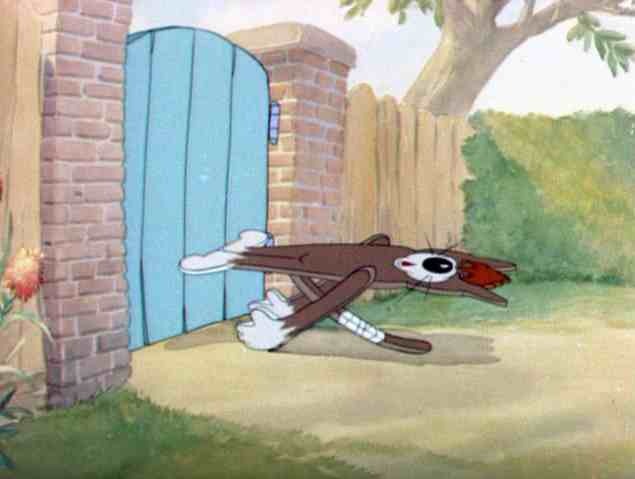 You are currently browsing the tag archive for the ‘Hanna & Barbera’ tag. 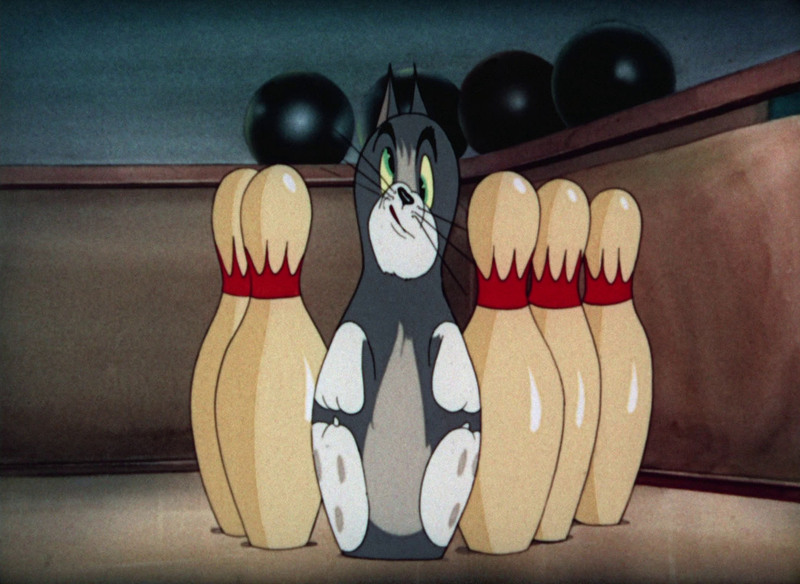 ‘The Bowling Alley Cat’ is the first Tom and Jerry cartoon to take please outside their familiar home setting. In this short the cat and the mouse play at an abandoned bowling alley. The short is mildly paced, but its timing is excellent and the silent comedy delightful, supported by Scott Bradley’s excellent score. 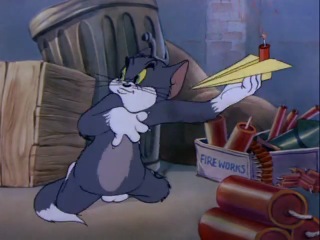 The film contains an early example of metamorphosis, in which Tom changes into a familiar household object, this time a ninepin. 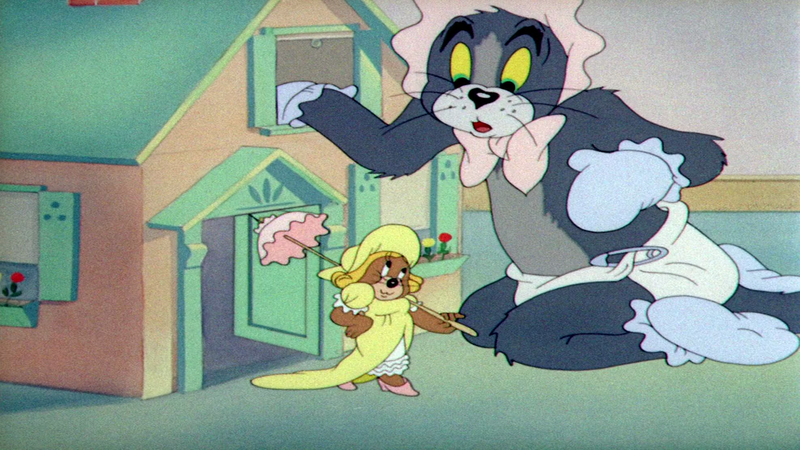 This type of metamorphosis would become a recurrent gag in the Tom & Jerry series. Compared to later entries Tom’s deformation in ‘The Bowling Alley Cat’ is mild, and still a little plausible. This kind of plausibility was abandoned the next year in the more frantic cartoon ‘Sufferin’ Cats‘. ‘Johann Mouse’ is the story of a waltzing mouse, who inhabits the home of Johann Strauss jr. in Vienna. 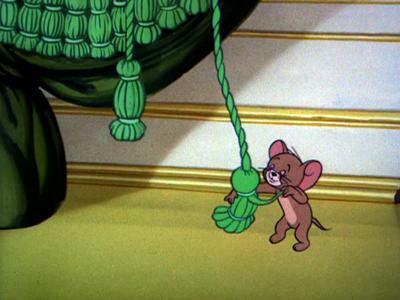 The mouse (Jerry) only comes out to waltz when the master plays, so when he’s out of town, the cat (Tom) learns to play waltzes to make the mouse waltz. This novelty leads to the two performing for the Austrian emperor. ‘Johann Mouse’ is a cute little fairy tale, told by a quasi-German voice over. However, the cartoon is hampered by all too economic animation. 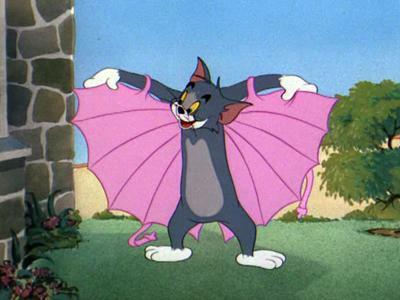 Especially Jerry’s design has become very streamlined and rather stiff in this cartoon, making his dance movements less impressive than in earlier entries. 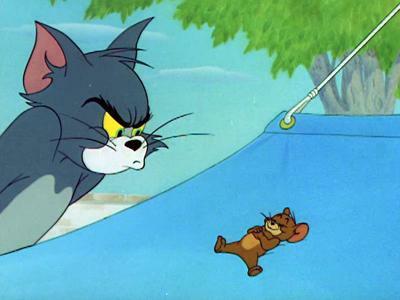 ‘Cat Napping’ is a blackout gag cartoon, in which Tom & Jerry are fighting over a hammock on a hot summer day. 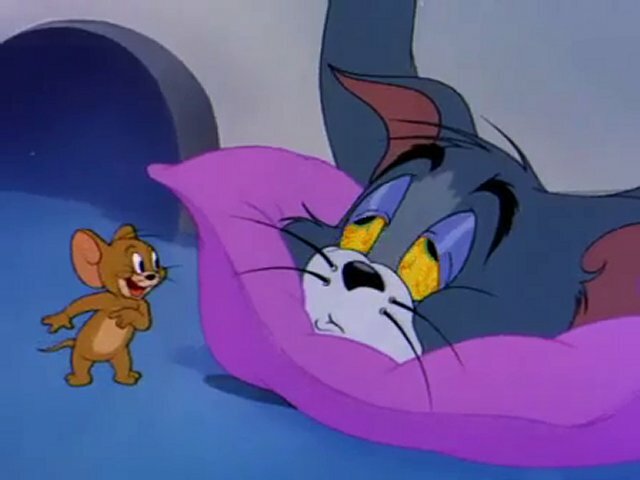 ‘Cat Napping’ is certainly not among Tom & Jerry’s best cartoons. The gags are not all bad (the best one is when marching ants make the hammock resonate), but the comedy feels uninspired. Moreover, the story is less consistent than usual, and the gags are rather disjointed. 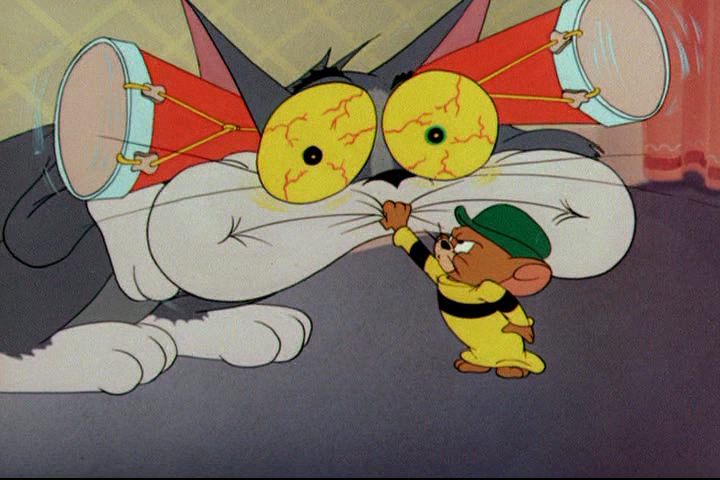 However, the cartoon is especially hampered by rather appalling designs on Tom & Jerry, which are on the same low level as those in ‘His Mouse Friday’ from earlier that year. While chasing Jerry Tom makes Tyke dirty. Spike threatens Tom he’ll tear him limb for limb, when he makes Tyke dirty again. So Tom does his best to keep Tyke clean. To no avail, because, as expected, Jerry takes advantage of the situation. 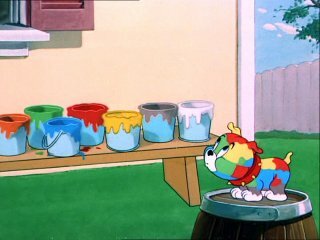 ‘Slicked-up Pup’ is based on a routine that goes all the way back to Tom & Jerry’s very first film (‘Puss gets the Boot‘ from 1940). Unfortunately, it has all been done before, even with cleaning (‘Mouse Cleaning‘ from 1948), and with Spike & Tyke (‘Love That Pup‘ from 1949). The result is less amusing than any of the previous films. 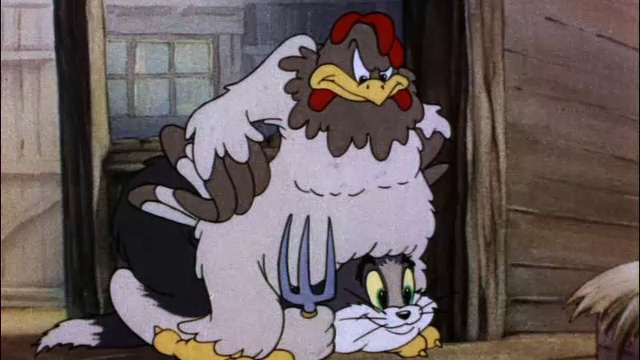 The best gag may be when Tom pretends Tyke to be a chicken. In the great opening shot of ‘Jerry’s Cousin’ we see multiple cats being clobbered by what turns out to be a very muscular mouse. 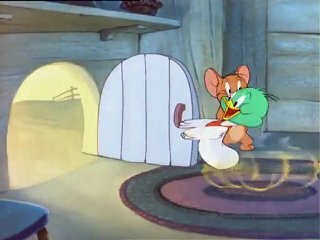 This mouse happens to be Jerry’s cousin. 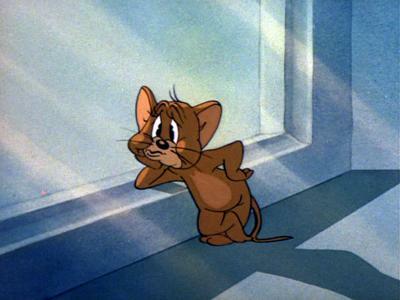 He receives a letter in which Jerry asks ‘cousin muscles’ for help, having ‘serious trouble with Tom’. Muscles takes care of Tom alright, but only after he defeats the three ‘Dirty Job’ cats Tom called in, Tom surrenders. In the future, Jerry will be safe. His surprised smile at the end of the cartoon is priceless. 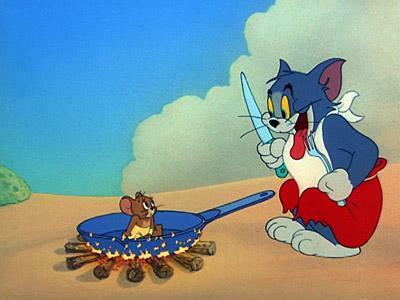 ‘Jerry’s Cousin’ is one of the Tom & Jerry classics. It’s a great gag cartoon, its storytelling and timing are both perfect, and it makes clever use of the invincibility theme. Tom’s listening to the radio where a french cook is telling about a fish recipe. 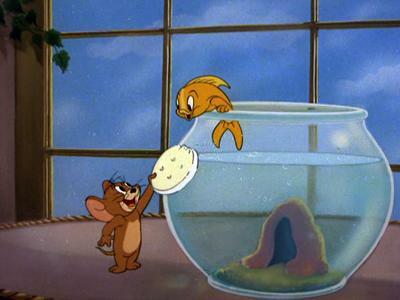 Tom immediately tries to cook the goldfish in various ways, but Jerry, who’s the goldfish’s friend, rescues him again and again. 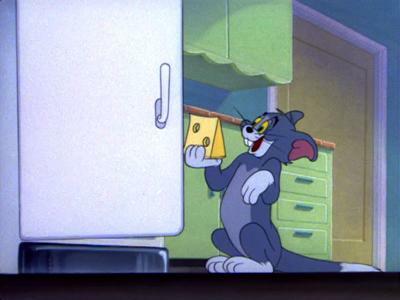 Unlike most Jerry-and-a-friend cartoons, ‘Jerry and the Goldfish’ is not cute, but fast and funny, with great gags coming in plenty, many of which involving deformations of Tom’s body. This makes ‘Jerry and the Goldfish’ easily one of the best Tom & Jerry cartoons using this theme. In 1966 Abe Levitow used the same story theme in the late Tom & Jerry cartoon ‘Fillet Meow‘, unfortunately with appalling results.